Marker Assisted Back Crossing statistics will calculate Recurrent Parent Percentages for each line across each chromosome, and will also display linkage drag and QTL status information if appropriate. You can run an MABC analysis by selecting Analysis->Marker assisted back crossing from the menubar. 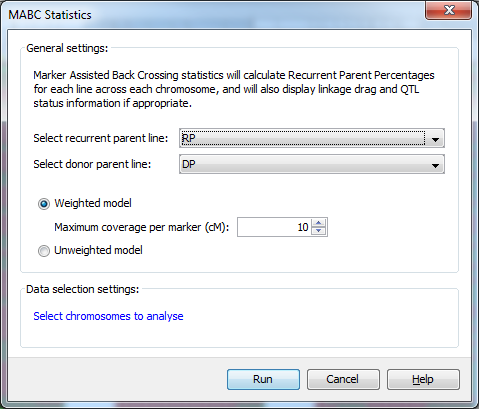 Using the MABC Statistics dialog you can select both the recurrent and donor parents with which to run a marker assisted back crossing analysis. You can also choose to use a Weighted model which specifies the maximum length of genome a marker can accurately represent in the analysis, or an Unweighted model which doesn’t take the amount of genome represented by each marker into consideration. In addition to this help page, you can also read the Marker Assisted Back Crossing Tutorial, which runs through the process of running the analysis and viewing the results with a sample dataset. To generate linkage drag statistics as part of the marker assisted backcrossing analysis, you must provide a QTL file in addition to your genotype and map data. This QTL file differs from the standard Flapjack QTL file as it requires an additional column of data to be able to make use of the data in the analysis. The Name to Experiment columns are required and must be included and listed in the order shown. After that, each QTL may have zero or more optional columns of numerical or textual data that can be included too. The Source column is required for linkage drag statistics to be provided. Flapjack will look for values of DP, and RP, indicating that the alleles we’re looking for are coming from either the donor parent, or the recurrent parent. The above chromosome has a length of 60 cM with 3 markers, where A is the recurrent parent genotype and B is the donor parent genotype. In the weighted calculation the user specifies the maximum length of genome a marker can accurately represent. For example, if 20 cM is chosen, each marker can accurately represent 10 cM on either side of the marker for a total of 20 cM. For the calculation of RPP the weights for markers 1 and two are multiplied by .5 because they are heterozygous and marker 3 is multiplied by 1 because it is homozygous for the recurrent parent. The sum of these values is divided by the total coverage (sum of the weights for each marker). In this example the RPP calculations do differ as the weights for each marker are not the same. The degree to which the calculations will differ depends on how evenly markers are spaced across the genome. It should be noted that, if no map is provided, the weighted calculation will give effectively the same results as the unweighted calculation.